Built on the site of a smaller kindergarten in Frederiksberg, Copenhagen, COBE’s project is designed to welcome 182 youngsters and was inspired by children’s drawings. 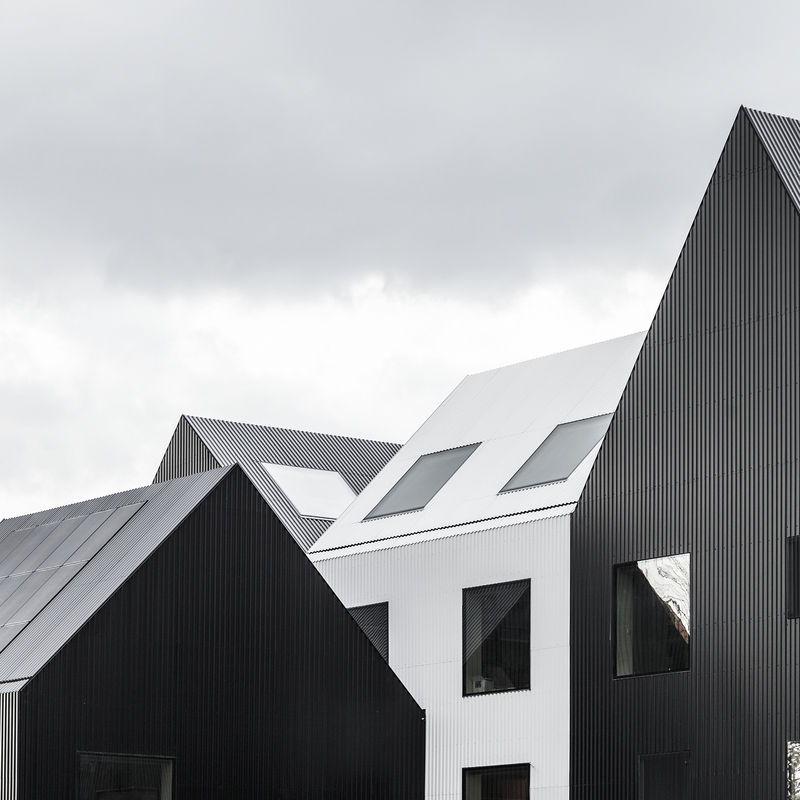 Frederiksvej Kindergarten is made up of 11 interconnecting houses, reflecting the scale of the urban environment. 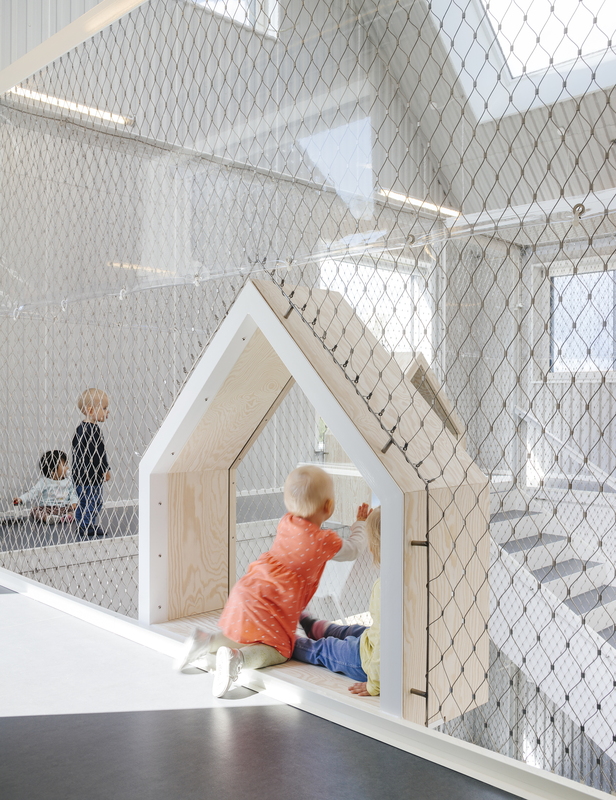 Standing on the site of a much smaller nursery for 30 children in Frederiksberg, one of Copenhagen’s most vibrant districts, the new Frederiksvej Kindergarten was designed by Danish architects COBE. The large day-care centre, which has places for 182 children, has become a symbol of the area while blending in perfectly with its surroundings. 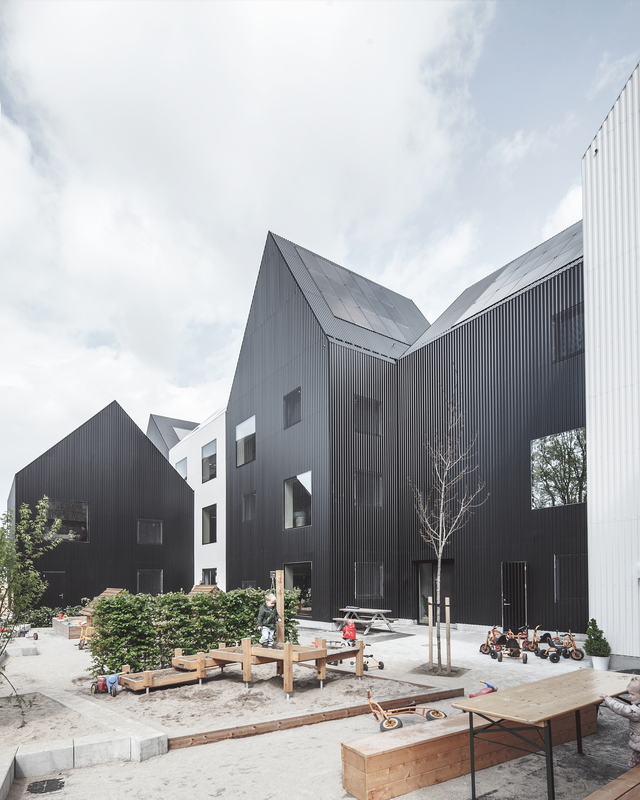 With its Frederiksvej Kindergarten project, COBE threw out the old idea of nurseries as the large, uniform buildings normally associated with state education. It wanted to return the focus to children and their relationships with others in a safe, family-style atmosphere. The architects replaced the sense of detachment, distance and coldness which children often experience at larger kindergartens with a sense of community and a common thread, albeit imaginary, linking the social setting of the school to the family ambience of the home. Based on the idea of a school as a group of houses with both similarities and differences, COBE imagined the buildings as drawn by pre-school age children. Frederiksvej Kindergarten is a series of houses which make up a model residential area, complete with neighbouring pitched roofs and a series of gardens. The project aims to reconnect the scale of the nearby residential district and its suburban homes and gardens with the large adjacent blocks. 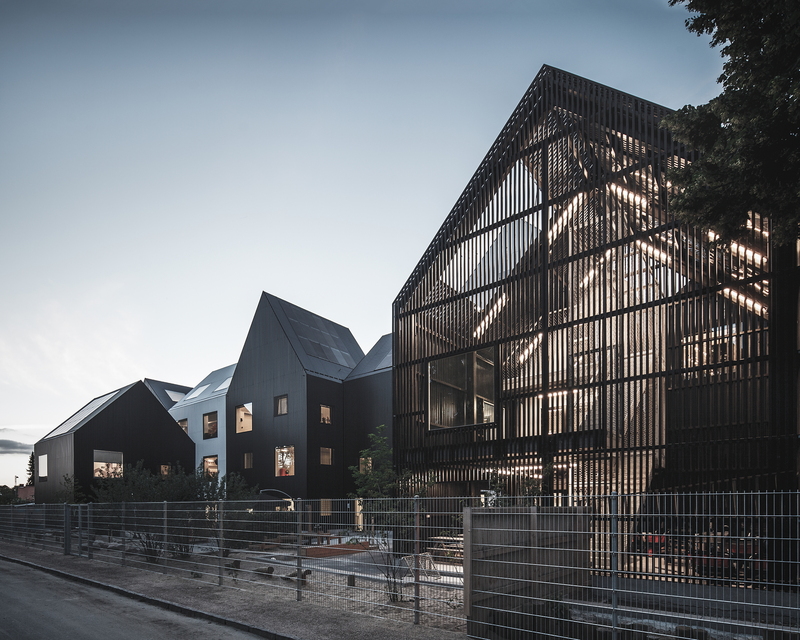 The new pre-school has the deconstructed look typical of a small but steadily growing urban fabric, yet its eleven units are interconnected on the inside so that all the activities associated with a large-scale educational institution can flow freely. Similarly, the height of each two or three storey unit relates to the height of the surrounding buildings. The idea of house-shaped modules is taken up throughout the interior, where each space contains its own micro-space in natural wood: here we find the kitchenette and bathroom, a service area which makes each room –and each class - self-sufficient. The building plans reveal two interconnecting hubs, two three-storey atriums around which the house-shaped modules are positioned (three around the first and three more around the second). The atriums connect the spaces horizontally and vertically, like squares onto which the children’s houses look on several levels. The idea is that these through areas and gathering spaces can be used for informal meetings with parents and teachers and will encourage children to play freely. 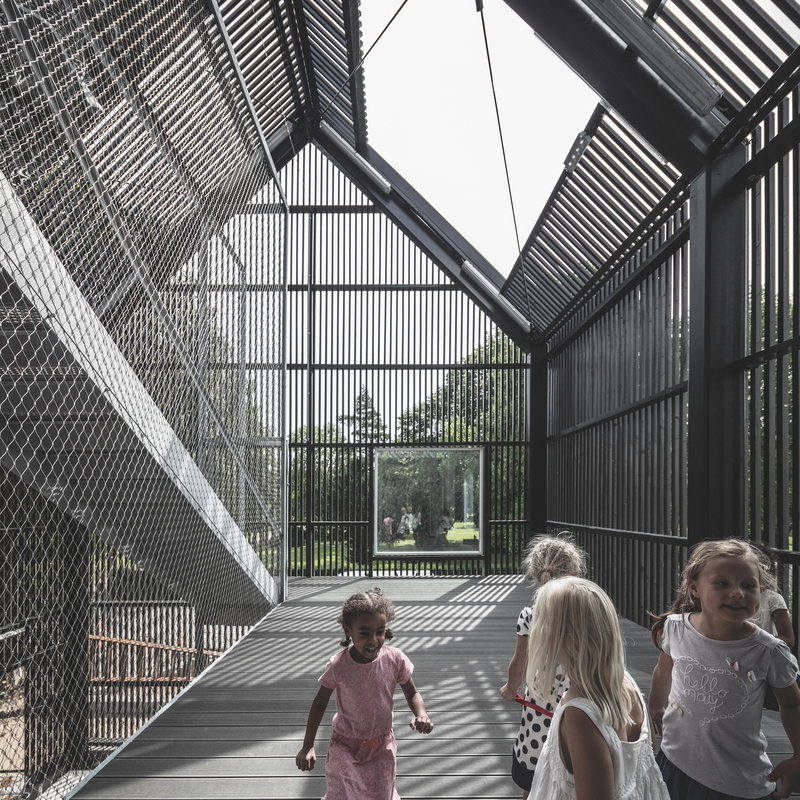 A circular walkway on each floor allows children to explore the space, while a metal mesh protects them if they should lean out. Light floods in from outside through the large skylights in each house, and from the inside through the atriums which convey it over each floor, the metal mesh posing no barriers. The caricature-like design of the houses is kept uncluttered with hidden gutters and flush-fitted window frames. But instead of using bright colours, the architects chose black and white for the façades. Rather than emphasising the building’s role with a strong colour palette, the designers used wooden battens which reduce the visual impact of each module. The façades of the outermost houses have more widely-spaced slats to boost ventilation, enabling the children to use the spaces as indoor “gardens”.